Last modified on Saturday, September 22 2007. 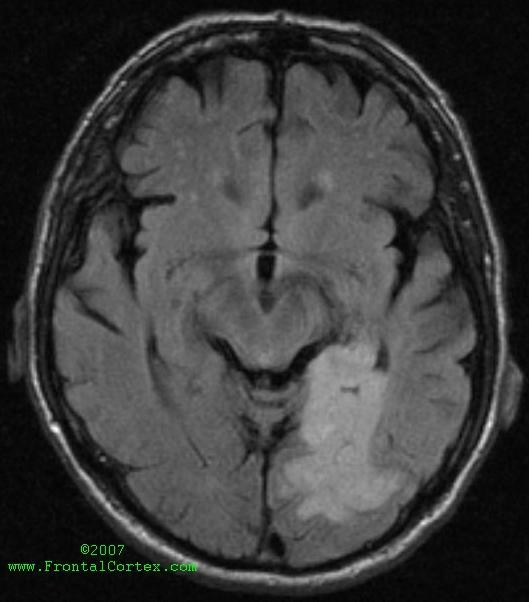 One day after after the onset of this patient's stroke symptoms, the above FLAIR MRI image was taken. Of the following choices, which syndrome is most likely to be found in this patient? This question was created on March 18, 2007 by jdmiles. This question was last modified on September 22, 2007. 2. Bradley, W.G., Daroff, R.B., Fenichel, G.M., and Jankovic, J. (Eds.) (2004). Neurology in Clinical Practice, 4th Edition. Butterworth Heinemann, Philadelphia.